BBC4 television will broadcast a one hour film about Pluscarden Abbey on Wednesday 25 October at 9.00 p.m. The title is: “Retreat – Meditations from a Monastery.” The genre of film is “Slow TV”. So there is to be no dialogue at all, and no commentary – see programme summary below. Filmed with an eye to the beauty and peace of the ancient surroundings, the film has a painterly quality that creates a feeling of restfulness and quiet contemplation. And by focusing on the natural sounds of nature and the peace of the abbey we have created a meditative soundtrack that adds to this unique experience. The programme will be part of a series of three, shown on successive nights. Downside Abbey will feature on Tuesday 24 October, and Belmont Abbey on Thursday 26th. There is also a BBC Radio 3 series accompanying this programme: Meditations from a Monastery, from Radio 3’s Slow Radio project. Pluscarden Abbey is a remote Benedictine monastery on the edge of the Scottish Highlands in Moray and is home to 21 monks. It is the oldest practising monastery in the United Kingdom, dating back to the medieval era. The monks live by the 6th-century Rule of St Benedict and life has changed little in hundreds of years. Given its isolated and weather-beaten position, the abbey is almost entirely self-sufficient. The monks grow their own crops, make their own clothes and have little contact with the outside world. Unlike most Benedictine monks who wear a black habit, the monks at Pluscarden Abbey wear white, a symbol of their austerity and strict interpretation of monastic life. We follow a typical day in the life at Pluscarden Abbey – from the moment one monk knocks on the doors of the brethren and chants in Latin to wake them up for the first service of the day at 4.15am right up to compline, the final service of the day before the monks retire to bed. 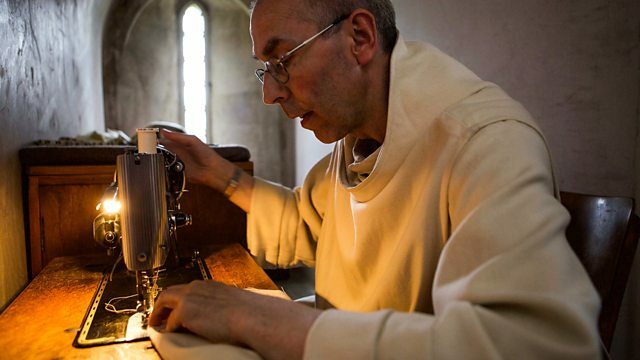 Brother Michael is Pluscarden Abbey’s resident tailor and weaver. Creating garments is his passion and we watch as he makes a distinctive white habit for another monk – measuring and cutting the material, hand stitching the design on an old sewing machine and finally washing it and presenting it to another monk. He also weaves a striking purple and white stole, a vestment worn around the neck by priests when giving confession, on an antique braid loom housed in one of the abbey’s workshops.